Water, soybean oil,vinegar (white, corn sugar, cider), dijon mustard (water, mustard seeds, white & cider vinegar, salt, white wine, citric acid, tartaric acid, spices, sulphites), honey, sugar, prepared mustard (water, vinegar, mustard seeds, salt), salt, mustard flour, garlic & onion powder, modified corn starch, dried egg yolk, spices, xanthan gum, sorbic acid, colour, reb a (stevia leaf extract), calcium disodium edta. 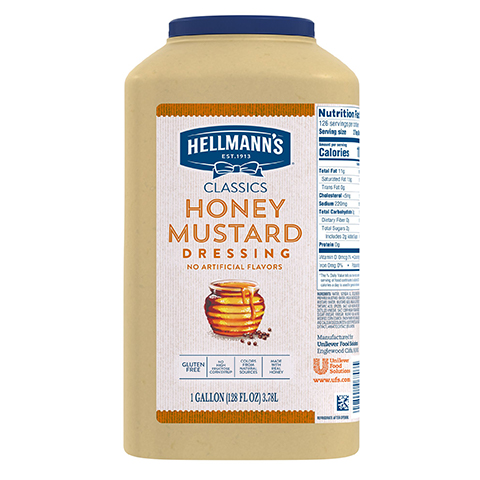 With its flavourful balance of sweet and spice, Hellmann's Classics Honey Mustard Salad Dressing offers a mellow taste that will satisfy even your most discerning patrons. This gluten-free dressing is made with real, simple ingredients that your guests can trust--including real honey--and it contains no high fructose corn syrup or artificial flavours. With grainy mustard seeds, it has a premium look and adds pleasant texture to salads and other dishes. Whether paired with a house salad, served as a tasty dip, or used as a condiment, this dressing is sure to leave your guests with a positive impression. Hellmann's® Creamy Honey Dijon is made with Dijon Mustartd and honey, is Gluten-Free and made with no artificial flavours, artifical or high-fructose corn syrup. The Hellmann's® brand is recognized throughout the world for unrivaled quality and flavor and its commitment to real, simple ingredients, real honey. Hellmann's® Creamy Honey Dijon is great on green or bound salads, on sandwiches, as a dip and more. Pour 2 oz. of Hellmann's Creamy Honey Dijon over a warm chicken breast and serve on a bed of mixed greens.